You are currently browsing the category archive for the ‘Weekend Cooking’ category. 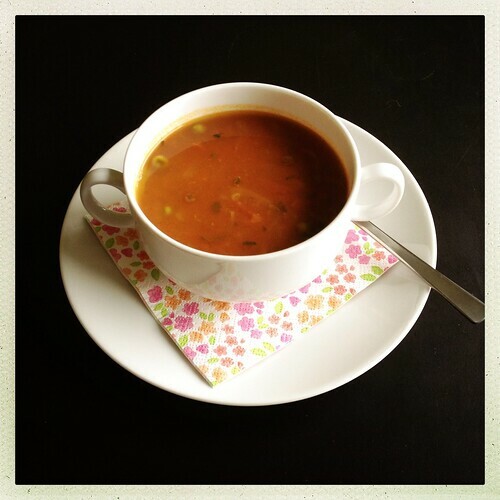 This Weekend Cooking post is a hotchpot of food-related topics that have been left stewing the past weeks. 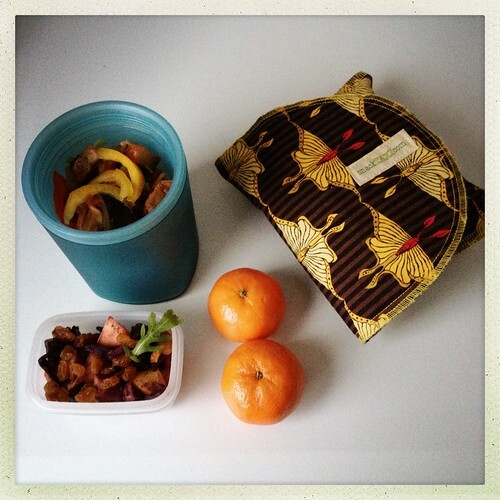 I’m focussing on bentos and swaps. Bento making has gotten a bit neglected lately; the following, hastily filled boxes are the only lunches I have to share. The brown rice with ratatouille in the round blue thermos is a leftover from dinner at my mother-in-law’s the night before. The small lock & lock box contains red cabbage coleslaw with apple, raisins and an orange dressing. Two sandwiches in the butterfly bag and clementines for dessert. Now what does this have to do with food? I hear you think. Well, the first two swaps I joined are food ’n drink-centered. Tea For You And Tea For Me, What’s Your Resolution? 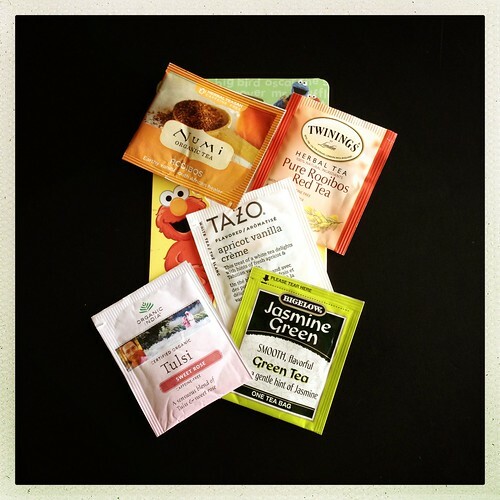 For the easy Tea For You And Tea For Me, What’s Your Resolution? 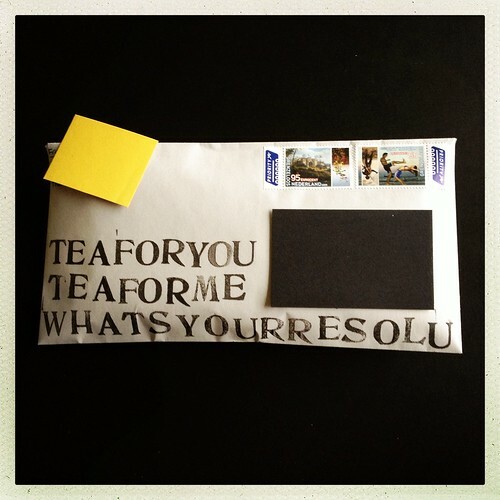 trade we had to send three bags of tea to our partner plus a note revealing our resolutions for 2013. I don’t do New Year’s resolutions, but I have things that I’d like to achieve this year concerning my health. So I shared those. 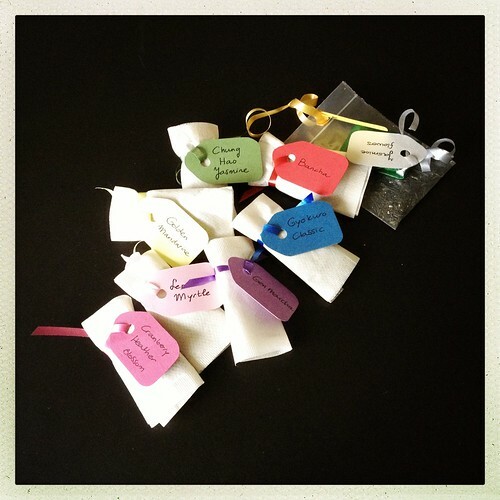 Myself, I was pampered with five teas in a lovely decorated envelope: pure rooibos red tea, earthy vanilla scented rooibos, Tulsi sweet rose, apricot vanilla crème and jasmine green. But I won’t tell what JessicaLynn1978’s resolution is! Recipe cards seem to be common in the States, but not here in Holland. I very much like the concept though! So I joined the Lovely Vegan Dinner Recipe Swap in which I had to share a virtual meal via recipes for a starter, main course and dessert. All animal-free. 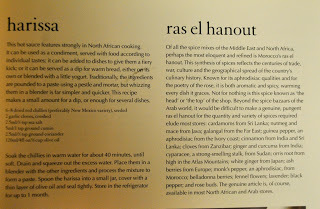 Luckily it was okay to make your own recipe cards as long as they had the standard format of approximately A5. So these are the ones I made for lob. Now I got the most AWESOME package from long-time veggie Seaglass! 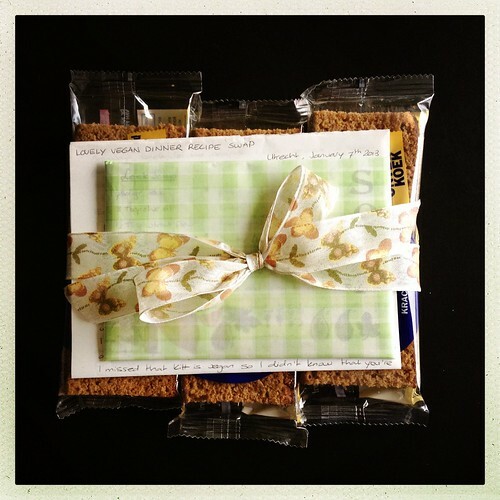 She put a lot of effort in making my parcel extra special — she’s the sweetest! 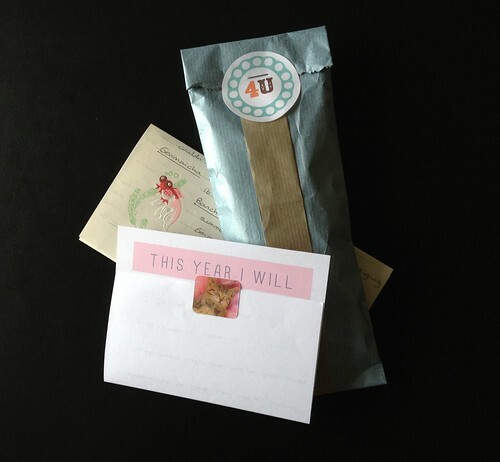 Seaglass also included some empty recipe cards for me to use and a load mouthwatering vegan candy bars — those are hard to get over here! And a packet of California powdered chili for me to compare to its Dutch counterpart: American recipes containing chili somehow always get too hot; even though I can usually handle heat. 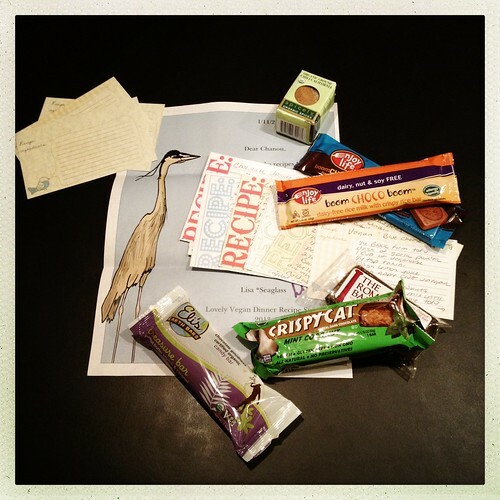 I LOVE the paper Lisa (Seaglass) wrote her letter on: it has a heron! So cute! That’s it for me now. Do you have some foodie news to share for Weekend Cooking? In June and July this year, the Dutch youth foundation Viva Las Vega’s organized the Veggie Challenge: a dare to eat less animal produce for at least once a week during a whole month. Depending on their diet, participants would set their own goals, e.g. 1 day vegetarian for omnis, a day vegan for vegetarians, an extra day veggie for flexitarians et cetera. 2000+ people gave it a go! Among them were three people I know — and no, I had nothing to do with that ;) Curious about their experiences, I decided to interview them for VeganMoFo. How would you describe yourself before starting the VeggieChallenge? I was a flexitarian. By the way, there are certain things I really refuse to eat. Those are tuna, lobster, veal, frogs legs. And of course only farm-laid eggs. Why did you decide to join the challenge? Because I think it’s better to eat less meat. For my own health, environmental issues and, equally important, because of animal welfare. What goals did you set and did you achieve them? Was that hard? My goals were to eat 4 days vegetarian and 1 day vegan. The vegetarian days weren’t that hard to achieve. The vegan days were the real problem. Mostly because I do like cheese a lot. And so many products I usually eat contain butter or eggs. What was you biggest discovery? What was the most difficult or disappointing? Eating vegan one day in a week. So many products that contain butter, eggs, gelatin, etc. It was even difficult to do shopping, find something that you like to eat on a sandwich instead of cheese, or, how can I replace eggs in a recipe. 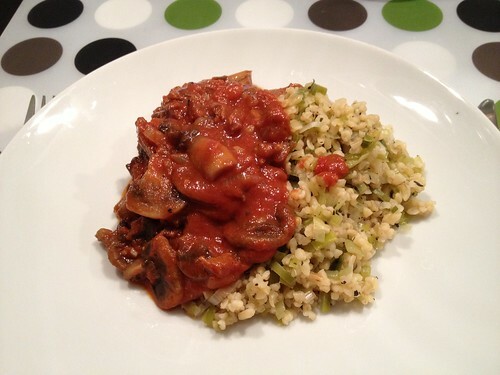 What was the best thing you ate or drank during the VeggieChallenge? If you’re in a relationship: did your partner join you in the challenge and how did he/she experience it? No, he didn’t. Sometimes I make a dish without meat and he’ll eat it. And if it tastes good he won’t mind eating vegetarian. But he likes meat too much to become vegetarian. Not to mention eating vegan. Has anything from the challenge lasted? I still am a flexitarian, but I now eat less meat/fish and more often vegan. Would you recommend the VeggieChallenge to nothers ext time? Why (not)? Yes, I would. It’s good to think about what you’re eating. The VeganMoFo theme on Graasland is ‘vegan en route’. Do you have a suitable tip to share with us? Do you know I’ve never tried banana on peanut butter? I guess I should! 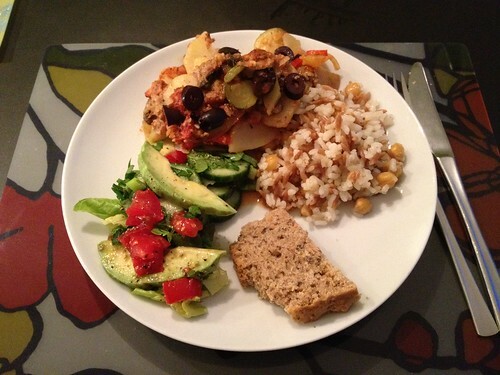 Thanks JannyAn, it’s fascinating to read about your experiences in the Veggie Challenge as a flexitarian. I recognize your frustration about how many products contain dairy, eggs or gelatin. As a vegetarian I never paid that much attention to labels, especially E-numbers,and now I’m shocked to find that some of them are not even veggie! So as a vegetarian I have probably been eating ground scale insects (E120), bones (e.g. E542, E640) animal fat (e.g. E470-479) and horse’s, cow’s, pork’s and even human hair (E920). Eew! Over viewing this series I’m so glad to see that all three participants look back positively! Imagine you’d join the Veggie Challenge next year, what goals would you like to set? First to go was YvonneP. Today I’m interviewing Uniflame from She Likes Bento. 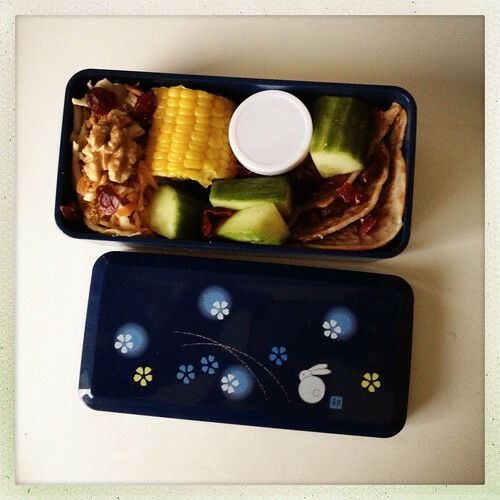 I think I met her two, three years ago on Twitter — my radar picked her up as a fellow Dutch bentoïst blogging in English about her vegetarian bento lunches. Since then we’ve discovered other similar interests, like reading books and doing challenges. She’s also a loyal participant of WeekendCooking. 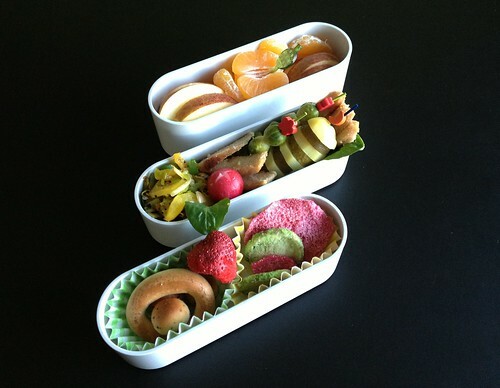 Here’s Uniflame’s most recent vegan bento. How would you describe your diet before starting the Veggie Challenge? Officially I am a pescetarian because I still eat fish sometimes. However I eat mostly vegetarian. Why did you decide to join the Veggie Challenge? 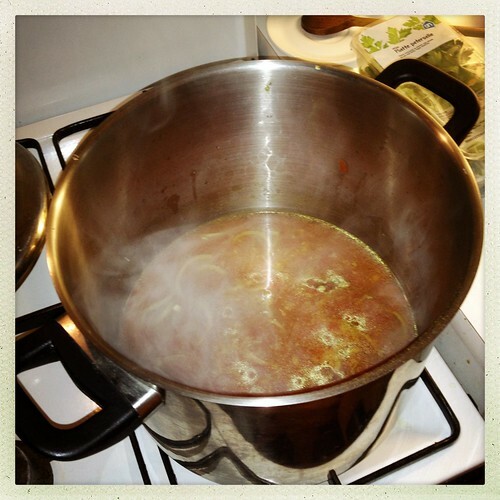 I like to experiment with vegan recipes, but some aspects were scary to me. Like vegan baking, for example. Committing to eat vegan for 2 days a week, forced me to step out of my comfort zone so I could experiment. I chose to eat vegan for 2 days a week and I did archieve that. Other than that I set some mini goals, like try vegan baking and make vegan snacks. I also wanted to eat outdoors as a vegan one time, but the latter goal I failed to do. That vegan baking doesn’t have to be hard at all, if you pick the easy recipes that don’t require to hunt down all kind of special ingredients. The most difficult was to not give in to cheese cravings. It can be difficult staying committed if your house still is full of non vegan stuff. Also: I hate the fact that a lot of stuff isn’t available in the supermarket, and that I have to hunt stuff down in a lot of different stores. Like vegan bread for example. You have to make most things yourself and with my poor health, I just don’t have enough energy to keep doing that. 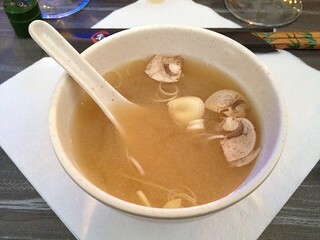 What was the best thing you ate or drank during the Veggie Challenge? He did join partially. He isn’t a vegetarian but we just cook the same main dish for dinner. So on my vegan days, he ate vegan together with me. And because I made more vegan snacks, like the muffins mentioned above, he also had those. But if he wanted a grilled cheese sandwich, he just ate one. Yes, I try to make more vegan recipes now than I did before. 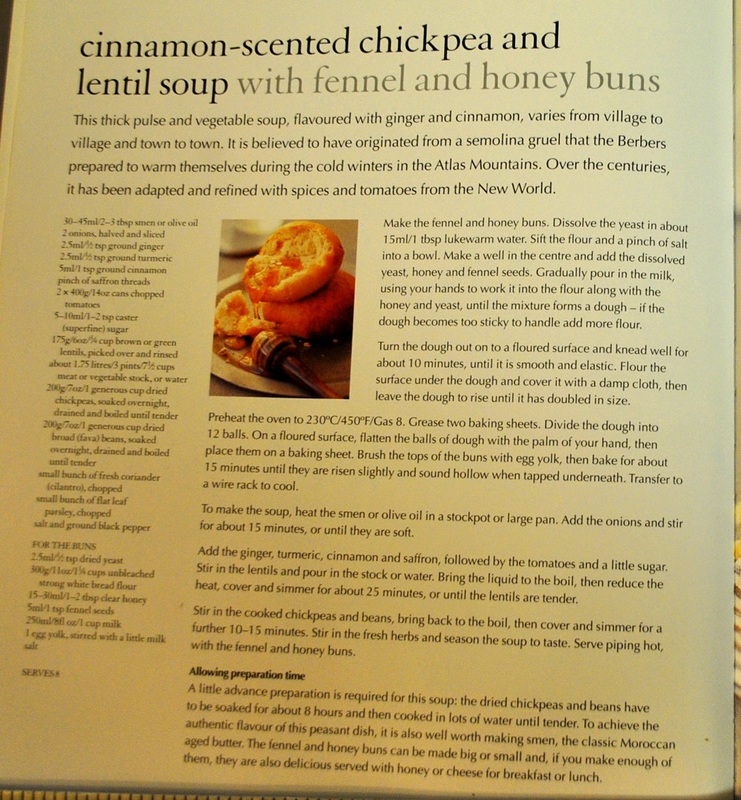 And I also made my blog more vegan friendly, like listing in my recipe index which recipes on my blog are vegan. My stack of vegan cooking books has grown and I love requesting vegan titles from NetGalley as well to review on my blog. Would you recommend the Veggie Challenge to others next time? Why (not)? Yes, I would. It is fun to have a reason to think out of the box. And even if you only go vegetarian or vegan for just one day a week, it makes a huge difference. The VeganMoFo theme on Graasland is ‘vegan en route‘. Do you have a suitable tip to share with us? Thanks Uniflame! I’m glad it all went well and I love how you set yourself some extra mini challenges — very creative! It doesn’t matter that you didn’t accomplish them all. I had expected you to share an avocado recipe with us though… But there’s plenty of those on your blog and with the vegan-friendly makeover they’ll be easy to find! In June and July this year, the Dutch youth foundation Viva Las Vega’s organized the Veggie Challenge: a dare to eat less animal produce for at least one day a week during a whole month. Depending on their diet, participants would set their own goals, i.e. 1 day vegetarian for omnis, a day vegan for vegetarians, an extra day veggie for flexitarians et cetera. 2000+ people gave it a go! Among them were three people I know — and no, I had nothing to do with that ;) Curious about their experiences, I decided to interview them for VeganMoFo. First up is YvonneP from Loisirs et Plaisirs. I met her on-line 14 years ago (!) when I joined the Dutch Boekgrrls, a virtual book club by mailinglist, exclusively for women. :) Later I got to know her in real life on book-related outings (swaps!). YvonneP’s asked to be represented by this colourful picture of red, blue and purple fruit. That doesn’t surprise me, as she once initiated a summer theme on the Kookgrrls’ blog for which she made a pink blackberry-yoghurt pudding/blob. I wonder if it can be veganized..? Before the Veggie Challenge (VC) I was maybe a flexitarian. I ate very little meat (don’t like most meat), sometimes fish, some cheese, but I love eggs, yoghurt and soft cheese (kwark). So that could be the hard part of the vegan thing. When I read about the VC I thought it was the best I could do, because of all the alarming news about food. I am really worried about the way food is produced and the way we are not told the truth about production mistakes, etc. Though I am not the sentimental type about animals I do not think it is right the way they are treated to serve as food. In the beginning I did not know what to eat my bread with on the vegan days. But then I discovered all kinds of spreads and now, long time after the challenge we never buy anything else. Those spreads were my biggest discovery! And because it was sometimes very hot I made loads of strawberry (!!) basil ice and melon mint ice! Just blend the fruits and put them in the freezer. Love fruits, love strawberries, love blueberries, love myrtilles (don’t know the English word for it). I can not decide what was the best we ate. I ate one recipe from the Provamel publication 20 Winnaars met smaak (shared below) with tofu and oranges that was extremely tasteful, but then again: so much was so tasteful. Wow. I’m very impressed how YvonneP (and her partner!) went way beyond her goals while she’d expected it to be difficult. It’s had a huge impact on their lives; a real success story! That’s several animal lives saved a year — yay YvonneP! Wash the orange and grate some of the skin until you’ve got half a tablespoon of orange zest. Squeeze the juice from the orange, add the raisins and et them soak until needed. 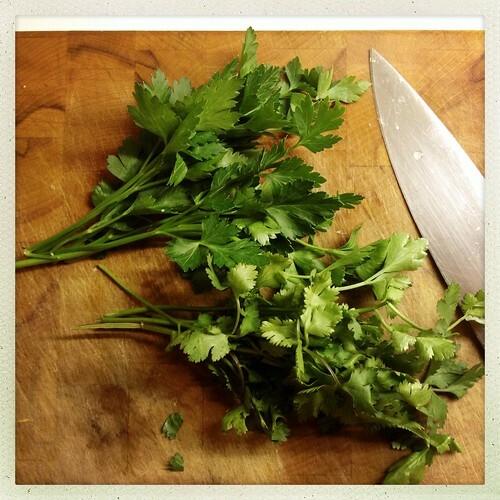 Chop the cilantro and onion (keep them separate). Cut the tofu into small blocks. Heat the oil and margarine together in a pan. Add the curry (powder or paste) and stir for 1 minute. Add the tofu and onion. Stirfry on high heat. Add orange juice & raisins, orange zest, apple-tea yofu, plus salt and pepper to taste. 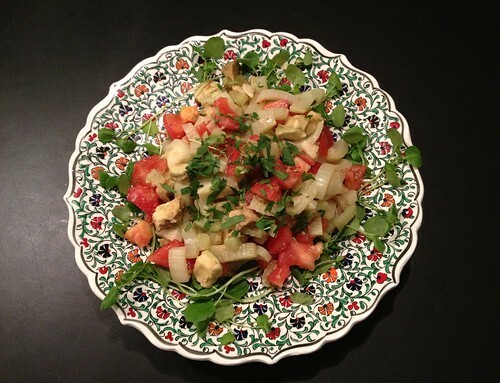 Garnish with almonds and cilantro and serve with rice. Sounds like an easy recipe that I must try sometime! Personally I would insert a step #0 to drain the tofu first (how to do this is described in steps 1&2 of the Faux Feta recipe on Graasland). 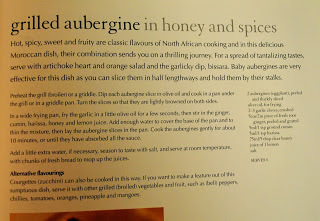 And maybe add some cinnamon which, to me, seems to go perfect with this dish. What do you think? Next week:Uniflame from She Likes Bento. 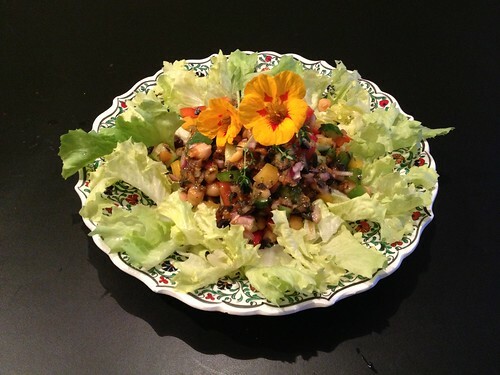 Last week I started a series of posts called Les Vacances de Mme Gnoe, about how I fared as a vegan on a recent holiday in the South of France. Obviously I survived. 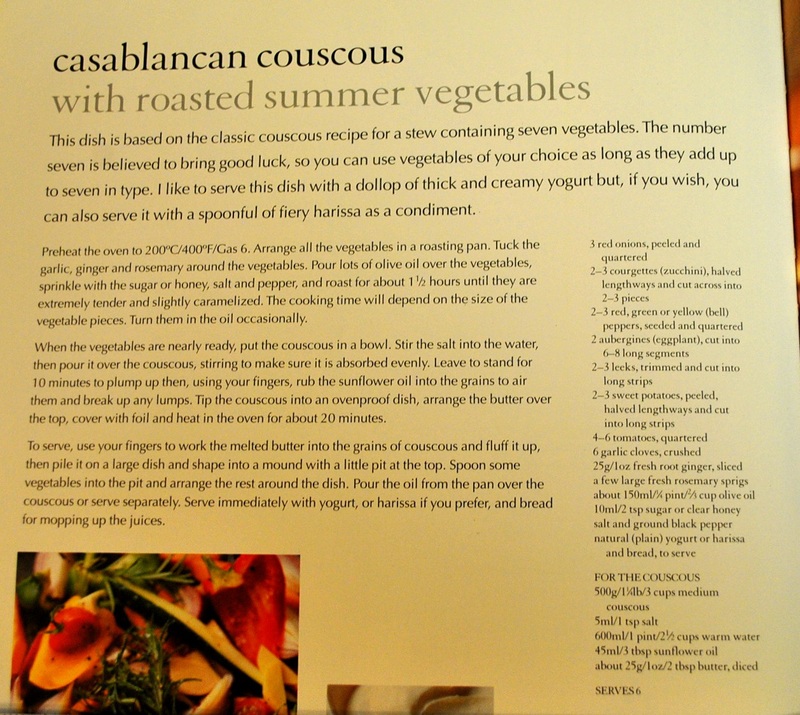 ;) It may help other newbie vegans going on a journey — or those worrying about going to the land of bouillabaisse, fromage and cassoulet. In the first post I related what to eat en route. 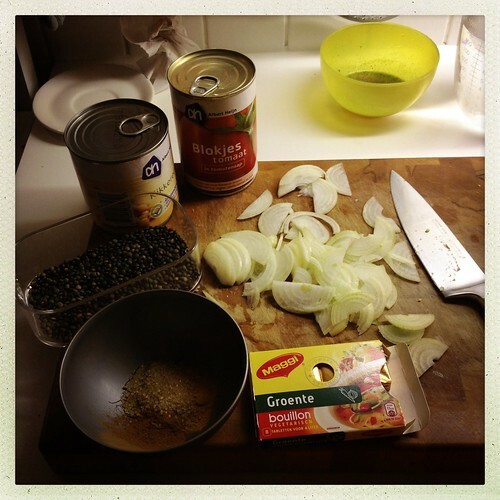 Today I’ll write about our first dinner in France, when we spent the night in Dijon. As a vegan it’s wise to be prepared when going on a trip. So if you’re not sure you”ll connect to the internet, do some homework before you leave! My first ‘stop’ was at Happy Cow.net: a worldwide database of vegetarian restaurants and grocery stores, also marking them vegan(-friendly). There were two places listed in Dijon: Les Pieds Bleus and Le Shanti. The first was one being described as “simple family type cooking, buffet style, in a typical French canteen atmosphere” — sounds great! So we dropped off our luggage in the hotel and set off in the direction of Place Emile Zola. 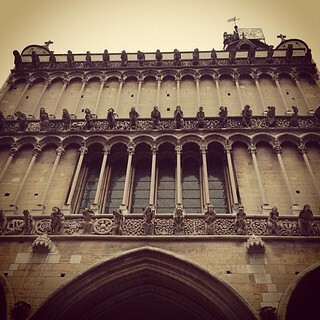 So we went to search for option #2, Le Shanti, window-shopping and making pictures of the medieval city on our way. This time we found the venue open. There were yummy things on the menu like veggie burgers, wraps, soups and salads. But… you get the picture? More like a place to have lunch or a just quick bite, not for a special occasion like your first holiday dinner! Back to the city centre it was, where wecould pick from a choice of restaurants on the aforementioned Place Emile Zola. Considering Lebanese first, we felt more like having Japanese and ended up at the Sushi King, “retaurant Japonais” (and that’s not my typo ;). 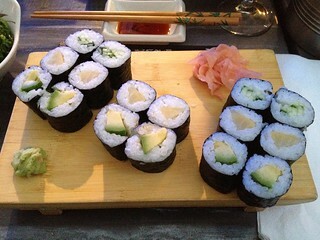 Here they served a vegetarian sushi menu consisting of miso soup, salade de choux (cabbage tsukemono) and three kinds of maki rolls: cucumber, avocado and daikon radish. 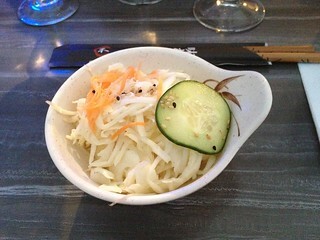 The usual condiments: soy sauce (sweet or salty), pickled ginger and wasabi condiments. 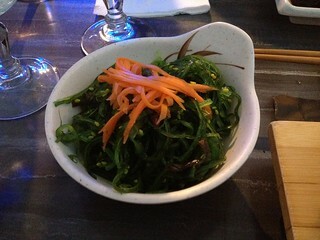 Since I’m a sucker for chuka wakame I ordered an bowl of salade d’algues as well. 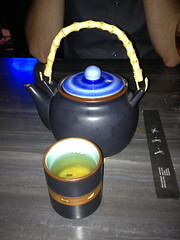 For dessert I enjoyed a whole pot of Japanese green tea. We had dinner outside, cozy among other establishments on the city square. The food was good but nothing special and, aside from plain or vinegar rice, these were the only vegan/vegetarian dishes on the menu. I haven’t asked whether the fried noodles with vegetables were (or could be made) vegan and it didn’t really seem like the place to serve food off the carte. The waiters were fairly quick and friendly, except for one young man who managed to whisk away our plates a little too early first and ignored us when we wanted to order another drink afterwards. He probably didn’t have his day. ;) We did. So. If you like to have a decent meal but aren’t too demanding, I can certainly recommend the Sushi King for a vegan dinner in Dijon! 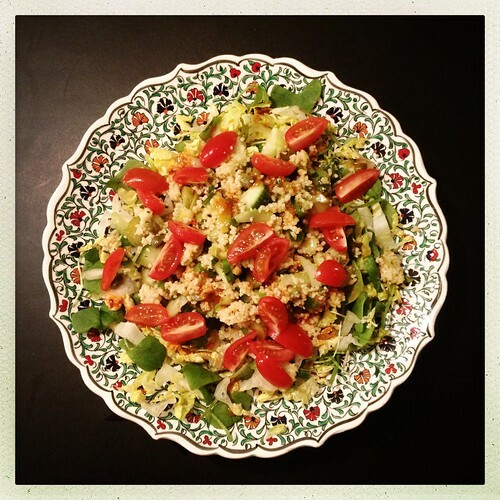 VeganMoFo Day 6 ~ Inspired! Yay for VeganMoFo! Not only did my readers suggest wonderful pear desserts, one of them ‘clicked’ with a recipe I’d just come across at one of my fellow MoFo-ers, Have Cake, Will Travel! 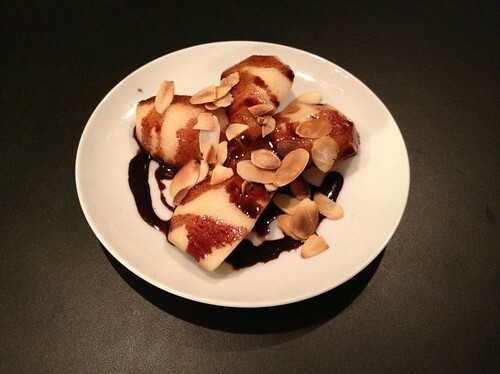 Here’s the pear with chocolate syrup and sliced almonds I had for afters last night. It was awesome! It would have been lovely on a pear tarte tatin as well. ;) But that was too much work for a Friday night. I made 1/3 of the original recipe -which is SUPER easy- and still have plenty left to experiment with this week. Ideas: chocolate milk, banana split adaptation, fruit or (speculoos) cookies dipped in chocolate, chocolate soygurt… I can go on and on! ;) A new favourite for sure. Try it!